First and foremost, welcome to the first of many art and design articles under the new brand, Designers’ Darkroom! So, in true pay it forward fashion, I’m using this outlet to share my recent discoveries of other artists from around the world, whether their focus is acrylic painting, oil on canvas, sculpture, or fine art photography. Let’s Start with Abstract Art! I love abstract art because it’s so easy to interpret the meaning of the work in your own way. 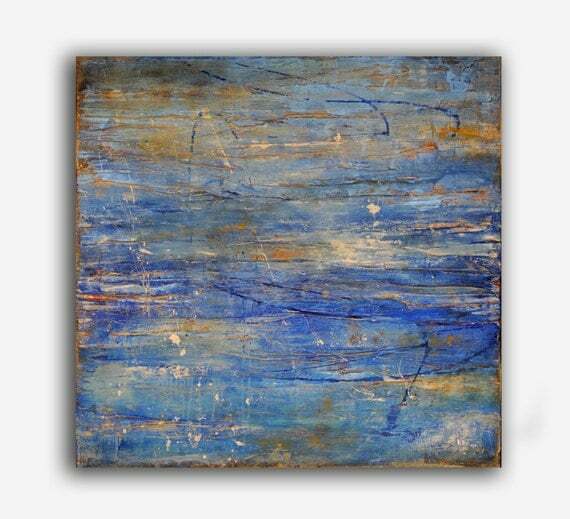 Abstract art can also be open-ended so the piece can be experienced differently with each passing glance. A painting will speak to you, but you may not understand why till you’ve had some time to think about it. Maybe it’s the vibrant color palette. Or its geometric shapes. Or the expression of a place you’ve recently visited. For whatever reason, this type of art is as mysterious as it is concrete. 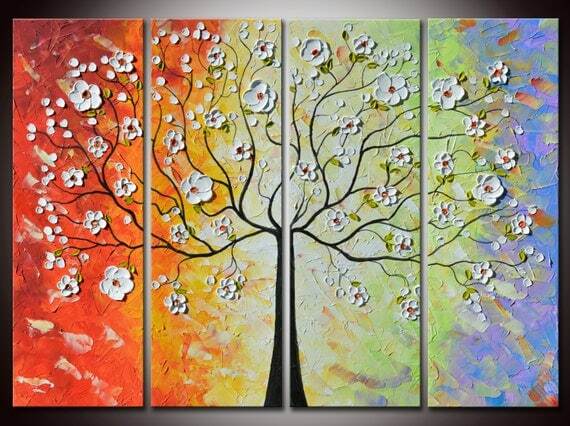 Helen paints contemporary abstract trees in a three dimensional way with pops of color and texture that is as delicate as a flower petal. 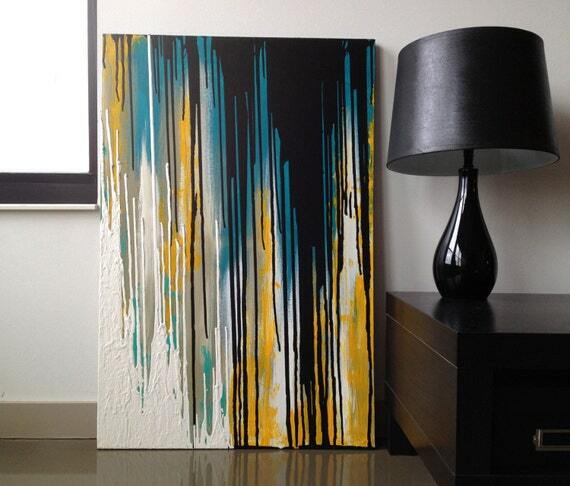 Canvas splits add even more dimension to the style of her paintings. She also paints landscapes and other natural scenes with the same technique; her focus is custom made art, so if you’re looking to have something created that’s one-of-a-kind for your space, go check out Helen’s Flower Art Painting Etsy Shop. Philippe is a passionate landscape photographer with a blur technique unlike anything I’ve ever seen. 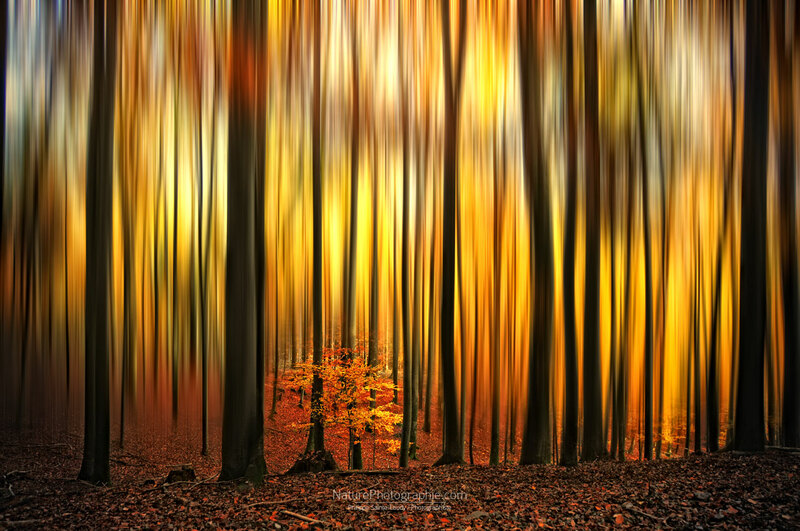 Firewall is an abstract woodsy scene that incorporates natural light glowing like fire through a cluster of trees. One stands alone. I simply love this artist’s work. Moonlit Harbor’s soft color palette and swirling strokes remind me of saltwater waves crashing against a wooden structure held together by rusted iron hardware. Erin Ashley is internationally recognized for her work in contemporary art; she draws her inspiration from nature’s way of beautifully weathering things. In addition to owning the original, you may also find Erin’s work available at some of the larger home decor stores like HomeGoods or Bed Bath and Beyond in a high-quality printed format. elements 1 draws me closer to mother earth with its organic, burnt sienna dirt that is slowly eroding because of the constant pounding flow from a waterfall. Norunn, like many others in this list, gets her inspiration from nature and its tranquility. 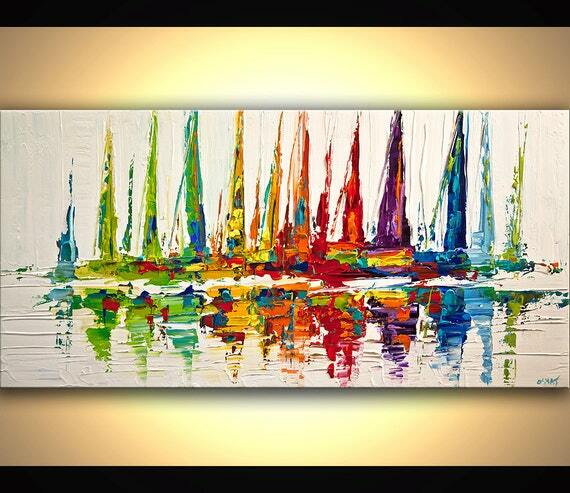 October Sail is an abstract piece that uses color to help you visualize its true meaning. Its color palette is warm like Autumn. Orange, red, yellow, and a touch of green are used here to hint at the changing season. Shades of blue against rippled white reflections also help to keep the abstract sailboats grounded by giving the viewer a sense of water in the painting. Osnat Tzadok’s work can be unraveled by reading into the work’s title; without that, you may see melted crayons or an audio waveform. Context is everything with Osnat’s inspiration. Inner balance and harmony are products of symmetry. My Teeth Itch can be a symmetrical play on the constant force by Greta’s new braces, where dark balances light and equal and opposing forces negate to create a harmonious balance, or simply put, straight teeth. As a lover of color, Beauty of the Soul by Henry Parsinia really speaks to me. First impressions are usually right on, but this piece is so amorphous, you can get lost in it for a while and come out with a deeper meaning each time. Initially, this piece displays some colorful swirls, similar to works by the legendary free-blown glassmaker, Dale Chilhuly. Then it hit me, Beauty of the Soul also has metaphysical qualities. Could souls have arteries and veins? Maybe there’s life after death after all. 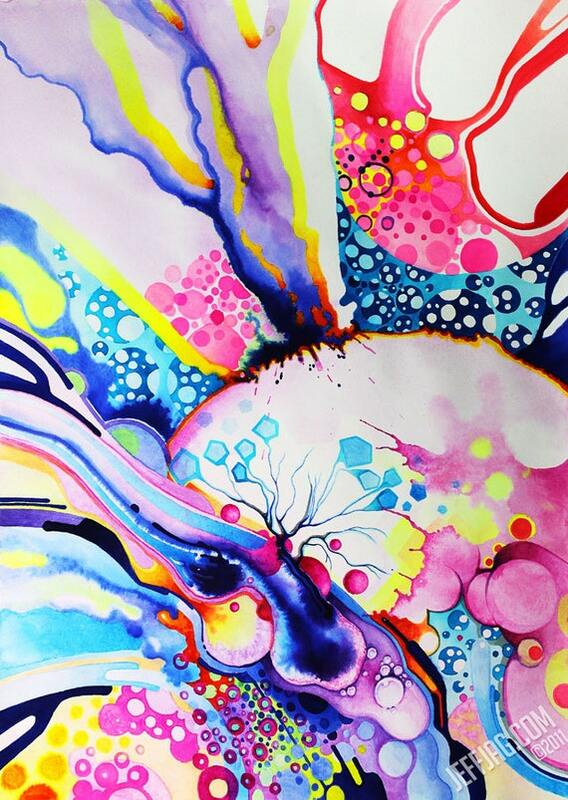 Infinite Flare is a watercolor abstract that represents biological cracks and veins to the artist while his wife sees a solar flare. Look deeper though. Think beyond just biology. Think of beautifully translucent and vibrant jellyfish tentacles in bubbly saltwater. Color in motion, blurred forms, and hard transitions come to life while defocusing my eyes. 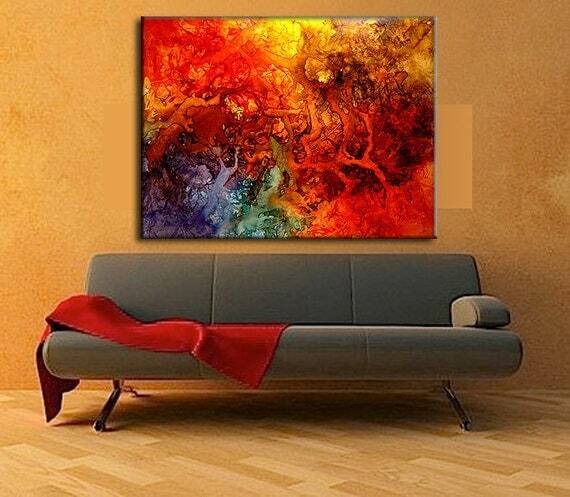 abstract N° 797 is reminiscent of a circus act with a colorful clown form in the center of the painting. Koen just brought me back to a colorful and fun childhood even if that wasn’t his intent. Each picture and associated artwork in this list is owned by the respective artist listed in the numbered heading. Images are hosted and linked from the originating website. If doing so infringes on an individual’s copyright, please send me an email and I will remove the image links associated with the text immediately. Next up… black & white art. See you in two weeks. Welcome to the re-launched blog of Thomas M Thurston, or freshly coined, Designers’ Darkroom! Rather than sharing a photo-a-day by yours truly, I’ll be repurposing this outlet to share recently discovered art and design along with newly released signed and limited edition photographs from time-to-time. What – Part I: Expect to discover artists, both new and seasoned, from many different genres and backgrounds. Part II: Expect to discover design ideas for your home or office that will transform a space from drab to fab. Part III: Expect to see the unexpected; that means items perceived as art, whether that is a watch, pen, or loudspeaker. How Often: I’ll publish a new article to Designers’ Darkroom every two weeks, so expect 26 unique posts each year. Stay tuned for the first of many to come! In the meantime, why don’t you acquaint yourself with Our Mission and Our Business Practices. It’s almost dusk and I can feel the sun on my face as the last light fades into the horizon. The forceful breeze off the Pacific creates crashing waves on the jagged shore where I stand. The wind’s whisper in my ear suggests to me there’s more to Mother Nature’s story here. 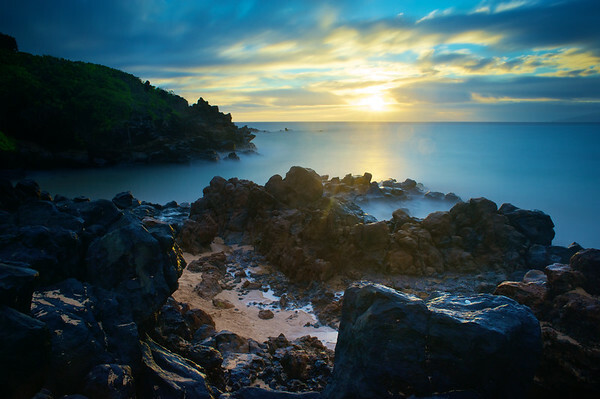 She says to me… there is a small cove where angels go to play. And where they go, mere mortals cannot survive because of the treacherous rock formations and crashing tide. It’s called Angels’ Pool and it exists only through the eyes of time. Before I jump into the Isle of Mull tour experience and since this is the first blog post of the New Year, Happy New Year everyone. I hope you’re all off to a great start in 2013! I wanted to share a quick blog post about Bowman’s Tours departing from Oban, Scotland. 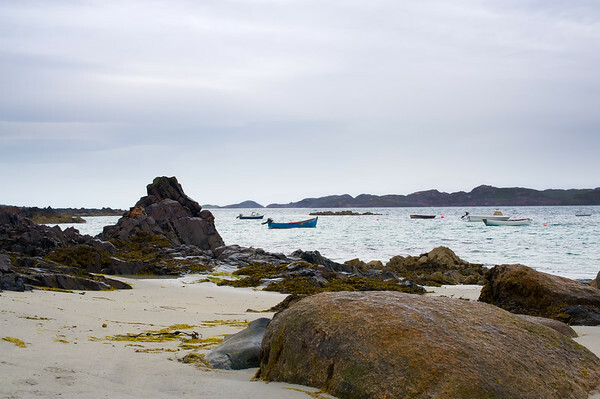 We opted for touring the Isle of Mull and Iona which departs from the beautiful Oban Bay. After almost missing the tour ferry, which was docked on the other side of the bay from our bed and breakfast, we were finally off with the wind at our back. This tour took the majority of the day so plan for that; and make sure to bring a rain coat just in case. 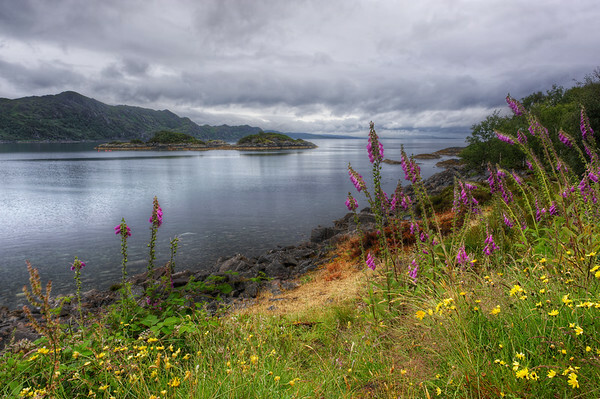 The tour begins with a scenic ferry ride to the Isle of Mull; once there, you basically board a tour bus and let your guide navigate on a single-lane, two-way traffic road. They have a saying in Mull: you don’t drive on the road, you drive on what’s left of the road. Apparently, road maintenance is a difficult task to keep up with here. The bus tour was nice, but I would have much rather brought the car aboard the ferry and explored Mull at my own pace. Lesson learned. I will say this, though… our tour guide was great and he provided us with fantastic explanations of Mull’s history, life on the isle, and local wildlife in the area. I was pleased to see seals along the coast and some very interesting trees. Also, not too far from the dock is a pretty little beach area. Good times were had by all on our way to Inverness, the capital city of the Highlands in Scotland. I’m not really one to enjoy driving in the rain while it’s dark outside; even more so when I’m in an unknown area. This is one of those trips that got the best of me here… I needed tack sharp concentration on the long, twisty roads because the windshield wipers couldn’t keep up with the buckets of rain these storm clouds were dropping. Let’s just say I’m glad this ride is done with and behind me. Edradour Distillery is known as Scotland’s smallest whisky distillery, but don’t let that fool you into thinking it’s not worth the visit. This place is the real deal and in my Scotland experience, Edradour gives the best whisky tour out of the few I visited. I say this because the master distillers know their whisky, will correct your misconceptions (if you have any), and go out of their way to please your taste buds. I enjoyed Edradour’s tour, but the real treat comes afterward. Contrary to what you might read on Trip Advisor or the other travel review sites, their tasting room cost (cash bar) is disclosed up front before your tour tickets are purchased and it’s made crystal clear that additional whisky can be purchased for a modest fee after the tour. Some people complain that it’s not free anymore… well, I will happily fork over a few pounds for a dram (or three) from a fine selection of whisky that can’t be found anywhere else. Not only does Edradour have a fantastic whisky selection, this distillery is the only one I visited in Scotland that allowed us to sample “The Angel’s Share,” which is defined as the percentage of evaporated whisky in the air during the casking period that’s been left for the angels to enjoy. “The Angel’s Share” in the warehouse is enough to get you wobbly! We opted to take the “whisky walk” to the Edradour Distillery. Unfortunately, we had to skip Blair Athol’s tour because tickets were sold out. Rick Steve’s “whisky walk” suggestion to hit these back-to-back left us hanging. So, in order to avoid the wasted trip to Edradour, we called ahead to make sure there were openings. We’re good to go. The “Edradour Walk” was underway… wait, where are the trail markings? Yeah… it took a little while to get the hang of things, but we finally found our way to the Black Spout, which is a medium sized waterfall on the way to the distillery. The trail markings were great up to the point “Edradour Walk” disappeared. We were faced to make a choice at a fork in the trail with different, but similar colored arrows; if I remember correctly, there was a yellow arrow with a white circle and a green arrow with a clear circle. We made the wrong decision and instead of getting to the distillery, we trudged through really high grass that had not been cut in months. We were also in the middle of a midge gathering. Don’t breathe… carbon dioxide only attracts more of these annoying bugs. No, must… stop. Whisky Trails is born. Driving in the UK is the complete opposite to what we’re accustomed to. The driver seat is on the right of the car and the cars drive on the left side of the road. So when you have oncoming traffic, cars whizz by you on your right, a sensation that I haven’t felt since acquiring my driving permit years ago. We toured the country in what was essentially a clockwise circle that originated in Glasgow and worked our way north and west till we reached Inverness. We had fantastic opportunities to see the Highlands and their breathtaking views along the way. 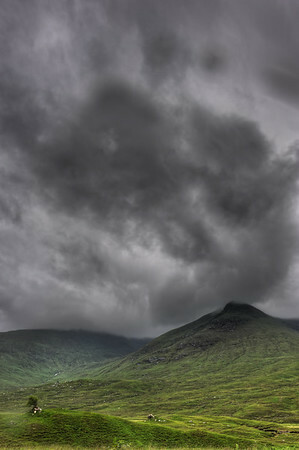 Rain clouds loomed and were never too far from sight; that’s okay because rain is beautiful in Scotland. It has this way of amplifying color–especially the greens. The Highlands are truly beautiful and worth seeing firsthand if the opportunity presents itself. The scenery changed dramatically from flat land to jagged rocks and huge green rolling hills (I may be a little off with that statement because I had my eyes glued to the road in total concentration for a lot of the drive). We were on our way to the Mallaig ferry when I spotted a patch of Fox Glove overlooking a loch with green landmass in the distance (that’s a lake for you westerners). I don’t remember too many of the location details, only that we were "12 Miles to Mallaig." My fiance and I just took our first trip to Europe together – Scotland was the logical choice; neither of us have ever been, so this trip was exciting in more ways than one! I scrambled to get the necessary paperwork together since I’ve never really needed a passport before. Expediting is a godsend by the way and well worth the added fee. We discovered the Rock N’ Roll marathon series sponsors a half marathon here (no, we didn’t run on this trip, thankfully). Scotland received rave reviews by close friends and relatives. The Highlands are absolutely gorgeous. Driving on the other side of the road was challenging and made me cringe quite a few times on the narrow, winding roads facing oncoming vehicles overstepping their boundaries, but I wouldn’t have done this trip any other way; I also have a new appreciation for Ford and a diesel engine. Our trip began in Glasgow after an overnight flight. We drove in a clockwise circle through Loch Lomond, Oban, Mull, Iona, Glencoe, Isle of Skye, Inverness, Pitlochry, St. Andrews, and finally Edinburgh, the country’s capital city. To sum up this trip in one word… epic. 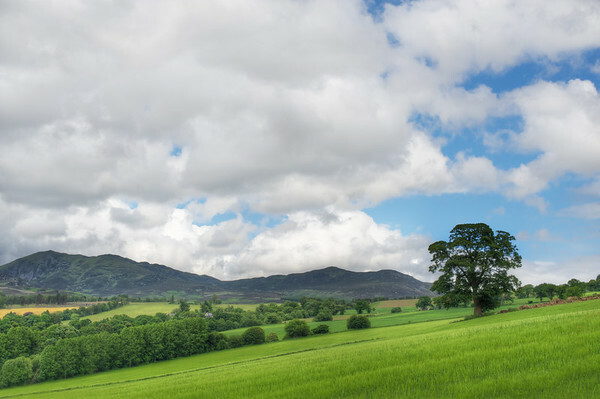 Scotland is beautiful, the food is fantastic, the cask beer is to die for, and the whisky and distillery tours are worth the trip alone. Prince William was knighted into the Order of the Thistle Thursday morning, which from what I understand is the highest order in Scotland. The only Order that precedes this is the Order of the Garter in England, which he also previously received. Cool stuff! And noble! 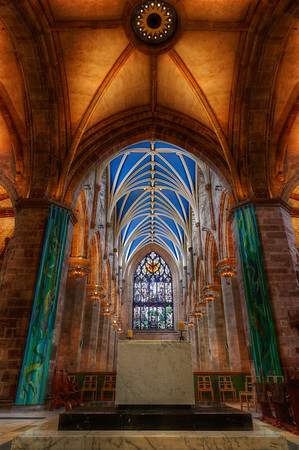 I had an opportunity to take a few photos at St. Giles Cathedral on Wednesday morning while most of the population was still having breakfast. I paid my £4 £2 to the cathedral and had to move quickly before visitors washed into my photos. I found the perfect vantage point, set up, and clicked a few frames. Here is the end result of today’s post. Enjoy! 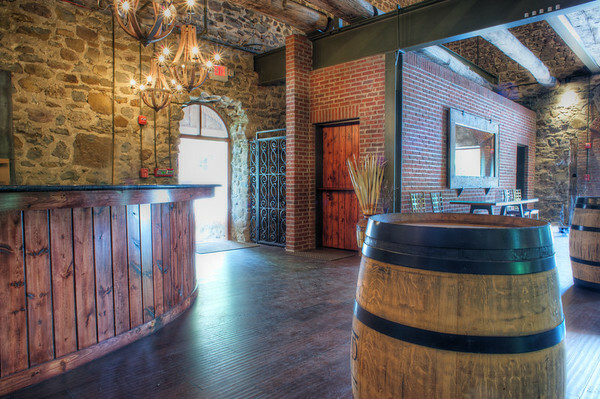 I love Brotherhood Winery; not only for their fantastic wine, but also their underground cellars and old stone hall. So what if the grapes are mostly grown in Chile. Technically, Brotherhood is not a vineyard because their grapes are grown offsite at other locations in New York; their grounds are still beautiful so it doesn’t really matter. At the end of the day, Brotherhood Winery has the oldest underground wine cellar in America and some of the most visually stunning tasting rooms I have seen to date. Try their Riesling; you won’t be disapponted! I recently picked up a new lens to be used for landscapes and interiors; it’s the Nikkor 24mm 2.8D for those of you that are interested. What really made me decide to go with the D model over the G is that the focal distance chart is easier to read than the 1.4G counterpart. Also, it’s not too important for my shooting style to have that extra two stops since I won’t be using this little guy for portraits. I have a nifty 50 1.4 for that sort of thing. I wanted to get my camera close to a foreground element, the barrel in this case, and see how sharp this 24mm lens is at its hyperfocal distance. If I remember correctly, I’d say I was just over 2 feet from the barrel, which still gave me an acceptably sharp foreground at f/16. I love these multiple light source photographs because of how they create such mood… particularly, those warm tones against the stone from the incandescent light fixtures mixed with swathing sunlight from the doorway and distant barn door.